We still feed the birds although some people question the activity. I also usually end all my radio shows with "Don't forget to feed the birds." Some say it makes the birds lazy or "it isn't natural." Adding seed and berry-producing plants to provide natural food in the garden is certainly good to do, but supplementing with bird seed mixes is also a helpful addition to their diets and an effective way to attract more birds to the garden. My recommendation to feed the birds started as an attempt to get people to slow down and take time to enjoy nature, but wild birds are also helpful at controlling insects. Bird feeding is easy, doesn't take much time, doesn't cost much, and isn't harmful to birds in any way. Providing food is simply a supplement to their natural diet. Most bird experts will tell you the same. A good book on the subject of bird feeding is Attracting Birds to Southern Gardens by Thomas Pope, Neil Odenwald, and Charles Fryling Jr. Birds will appreciate your help more during the winter and summer than in the spring and fall months. You should feed birds year round, but don't expect to see as many cardinals, sparrows, doves, and others in the spring when the juicy insects are plentiful or in the fall while plants are producing plenty of berries and seed. 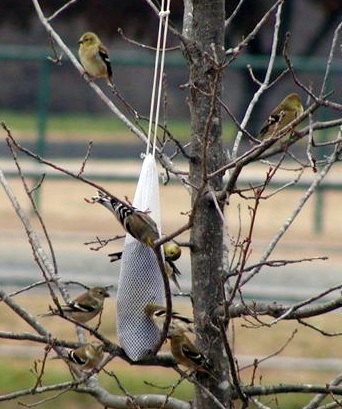 Because of their different feeding habits, various birds are attracted to different foods. Some birds are almost exclusively seed eaters while others eat both insects and seeds. Among the seed eaters are cardinals, chickadees, finches, nuthatches, titmice, sparrows, juncos, jays, doves, pheasant, and quail. To attract juncos, doves, and other ground feeders, put sunflower seed and smaller seed on the ground or in dishes. Finches, on the other hand, prefer hanging feeders filled with black thistle seed. If sprouting occurs under feeders as a result of feeding birdseed and this is a nuisance, try using safflower or peanut hearts. These seed will not germinate under feeders, and birds love them. Many birds love sunflower seed, but be aware that the raw, uncomposted hulls are toxic to plant growth. Expect a dead spot under the feeder (or put the feeder over a paved or mulched area). Cardinals, chickadees, and even finches like safflower seed. Squirrels, jays and grackles don't like safflower seed. Most sparrows don't either. Probably the best way to feed the birds is to plant or conserve plant varieties that produce edible seed, berries or nectar. Good choices include yaupon holly, elderberry, serviceberry, camphor tree, hawthorn, dogwood, persimmon, loquat, fig, eastern red cedar, magnolia, crabapple, mulberry, wax myrtle, Mexican plum, black cherry, hog plum, Carolina buckthorn, barberry, burning bush, cotoneaster, American beautyberry, hollies, mahonia, Chinese photinia, roses, rusty blackhaw, viburnum, coral vine, sunflowers, hibiscus, lantana, Turk's cap, coral honeysuckle, poke sallet, blackberries, and nasturtiums. The mockingbirds in my garden definitely have a favorite food - it is chile pequin. They eat the small, hot red peppers like jelly beans as fast as they mature. Chile pequin is a perennial in most of Texas and the Gulf Coast. Burning bush (Euonymus elata) is another favorite of several bird species. P.S. The Organic Club of America is a community of people with a passion for natural organic gardening and living. If you aren’t a member yet, we hope you will join us today.